More and more home remodeling projects are including large open spaces with multiple uses instead of smaller rooms with a single use. Sometimes the need arises for a less formal space, a place where family members can spend quality time together in a relaxed atmosphere. A multi-purpose room has become the new family center. As a result, hobbies and laundry are ideal companion activities to share this space. The space can be designed such that there is enough room for all family members to do their special activities, alone or together. For example, Mom or Dad can do the laundry while the kids are painting or building puzzles. There are several elements that are popular in hobby and laundry rooms which help make the space more functional. For example, add a TV or a sound system for enhanced usability. Everyone needs room to work. Layouts for the room might include counters that that run along some or all of the walls. For extra room to work, tabletops or islands can be placed within the room, or perhaps pull out or fold down for convenience. Countertop materials range from wood to laminate to natural or engineered stone. Give some thought to scratch-resistant and stain-resistant surfaces that wear well and fit their purpose. Where there are activities, there are supplies. 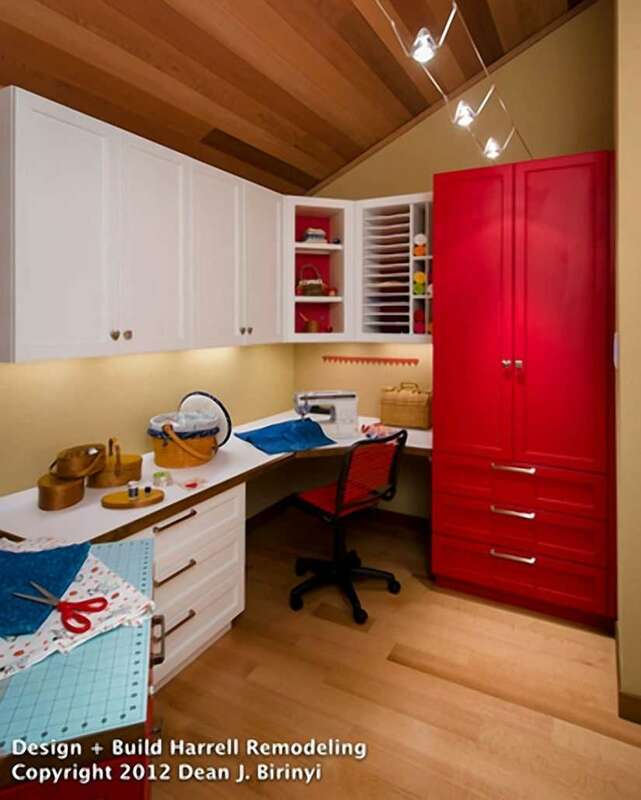 Ask your design build team to create cubbyholes, drawers and storage space above or below the countertops and workstations. This can help you minimize the clutter and keep it a pleasant place to spend time together. Cabinets can include a fold-down ironing board, a place to fold clothes and an area to store laundry supplies. Choose flooring that is smooth, moisture-resistant, durable and easy to clean while coordinating with the rest of the decor. Use area rugs to create extra comfort and a cozy feel to select parts of the room. Lighting is one of the most important features to the new hobby room and laundry room. Use natural light from large windows and put focused task lighting over specialized work spaces. Recessed lighting throughout the room can help illuminate even the largest spaces. Innovative doors integrate interior with exterior Two Simple Design Ideas to Ponder as You Start Your Design Journey!